Clinical Care Skin Solution's Later Alligator is a very hydrating and lightweight cream that contains grape seed oil and Vitamin C, which are very powerful anti-oxidants. Skin will be smoother and firmer and complexion even-toned. Later Alligator aids in the repair of sun damaged skin and collagen synthesis. Clinical Care Skin Solution's Later Alligator is a very hydrating and lightweight cream that contains grape seed oil and Vitamin C, which are very powerful anti-oxidants. They provide the ultimate protection from devastating and aging effects of free radicals. Skin will be smoother and firmer and complexion even-toned. 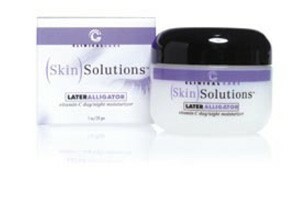 Later Alligator aids in the repair of sun damaged skin and collagen synthesis.